An image from Ford's "Go Further" TV commercials: The automaker is wooing customers in import-dominated states who, it says, may have preconceptions about the Ford brand. So for the first week, the spots ran without references to Ford or the blue oval. DETROIT -- Ford wants consumers to judge the 2013 Ford Escape crossover and Fusion mid-sized sedan on their own merits, without preconceptions of the brand getting in the way. Redesigned versions of the two, which are among the brand's top-selling vehicles, are being launched this year. That's why Ford removed references to its name and famous blue oval in its "Go Further" TV commercials that ran the week of April 30. And that's one reason the Ford name was removed from the front of the face-lifted 2013 Flex crossover. Twenty percent of Flexes are sold in California. Ford is wooing customers there and in other import-dominated states on the West, East and South coasts, which the company says account for 70 percent of U.S. retail sales. Ford badly wants the Escape and Fusion to sell well on the coasts. "We're aiming these ads directly at the skeptics," Jim Farley, Ford Motor Co.'s global marketing chief, said in a recent Ford blog. "These consumers have blinders up when they see a Ford logo, so we have to do something that's disruptive and unexpected from a car company if we expect to get noticed by them." Farley calls Ford a "challenger brand" in the United States these days, which means Ford must use unconventional tactics to get noticed by customers who have shopped only import brands for decades. As Farley knows well, it's one thing for a customer to click on a Web site to look at some vehicles, and it's quite another to write a check for a new Escape or Fusion. "It really does come down to the execution of these two launches," he said. But first he has to get buyers' attention. Farley believes that customer perceptions of the Ford brand are at a tipping point, and that new vehicles such as the Escape and Fusion can show off the brand's improved fuel economy, driving dynamics, advanced technology and quality. Farley said Ford has been working for five years to rebuild favorable opinions among customers, which lagged badly behind Toyota and Honda as recently as 2008. Opinions of the Ford brand have risen markedly since then, he said, citing internal research. The unbranded commercials, part of the "Go Further" ad campaign, topped Advertising Age's Viral Video Chart for the week of April 30 with nearly 3 million views. The report ranks social-media brand advertising campaigns based on the number of views. Advertising Age is a sibling publication of Automotive News. The spots directed customers to a Web site, gofurther.com. Ford said 40 percent of the customers who clicked on the site clicked through to the ford.com Web site. California accounted for the most traffic with 9 percent, followed by New York, Texas, Florida and Pennsylvania -- all states Ford says it needs to reach. Much to Ford's surprise, customers clicked on the C-Max Hybrid more than any other vehicle except the Fusion. "The C-Max is an all-new nameplate we don't even sell in the U.S.," Farley told reporters at a briefing. "I wouldn't have thought we'd get tens of thousands of people." The C-Max goes on sale in the United States in the second half of the year in two versions: the C-Max Hybrid, a conventional gasoline-electric hybrid, and the C-Max Energi, a plug-in hybrid. Before the C-Max arrives, Ford is launching the redesigned Escape this spring and the Fusion this fall. The Escape and Fusion trailed only the F-series pickups in Ford sales in 2011. Matt VanDyke, head of Ford marketing communications, said: "We have to leverage these fabulous new products in these environments." 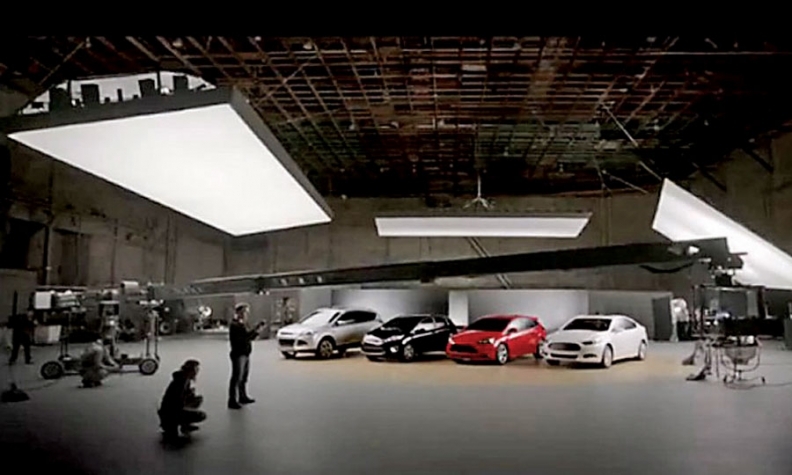 After a week of the unbranded commercials, Ford started a new set featuring the brand and the blue-oval logo. "Go Further" is on its way to becoming Ford's advertising slogan globally, replacing two earlier campaigns: "Drive One" and "Feel the Difference." It's all part of Ford's effort to coordinate its messages worldwide in concert with the launch of a new generation of global products developed under the company's One Ford product development system. Ford will continue using real customers in its commercials and the actor Mike Rowe. The unbranded ads were Ford's chance to reach out to "customers who are the most skeptical, the ones whose preconceived notions of the brand were the most hardened," Farley said. "We asked them to reconsider for a week."